KDE has had something of a rough time over the last couple of years. The transition from version 3.5 to 4.x hasn't been easy, and over this period many distributions have decided to use either Gnome or stick with KDE 3.5 as their default desktop. But we feel KDE 4 has now matured to a point where most KDE users can safely dump their old desktop and move on to the new one. There are very few stability issues, and most of the functionality found in 3.5 has been migrated to 4.3. If you're an ardent KDE user this means switching to a KDE-centric distribution, for the simple reason that distros based on KDE best understand what KDE users need. Rather than providing simple packages for KDE, a KDE distro is likely to include GUI refinements, usability tweaks, custom themes, artwork and a good selection of KDE applications. It's also nice when Gnome and GTK applications play happily with their KDE counterparts, especially if a compatible theme has been chosen from them both. KDE based distros should be able to do this better than simple Gnome desktops. But regardless of how optimistic we'd like to be about KDE version 4, it's still a desktop that's in development freefall. Any KDE 4 distribution worth its salt will need to be recent, up-to-date, and ideally, open to a constant stream of new packages as the KDE developers patch and add features. We need a distribution that's going to blend the latest features and fixes into either a rolling update, or a new, updatable distribution you don't have to wait too long for. Only then can KDE get back on-top as the desktop of choice for Linux users. We're starting with Slackware for two reasons. The first is that it's a no-fuss distribution that makes very few concessions to 'enhancing the user experience', and the second is that it typically installs the most unmodified packages of any Linux distribution. This is obvious from the first launch after the text-based Slackware installation routine. KDE's default blurry blue background greets you, complete with the default panel, the default selection of icons, and the default theme. This is KDE back to basics. Unlike most other distributions, this includes an icon that most packages would rather ignore – the purple and blue globule of the Nepomuk Strigi module secreted between the clock and the alarm. This is the front-end to KDE's pervasive search engine, and if you click on this icon followed by the 'Configure' button in the window that appears, you can ask it to start creating an index of your files. We couldn't get it to work without messing around with the command line, which is probably why most other distributions hide it. On the positive side, Slackware includes the full complement of KDE plasmoids, which means esoterica like the Blue Marble and Conway's Game of Life. Slackware has a problem with getting fonts to display correctly. We've seen this behaviour before when we've compiled our own version of KDE, so it's not surprising that Slackware suffers similar problem. It's easy to solve with the System Settings font selector, but it's a sign that very little has been done to make the average user's experience any better. But then, what can you expect from a distribution that still requires you to type startx to launch the graphical desktop? The equivalent of the value range in a supermarket: it's the same food, just without the nice packaging. 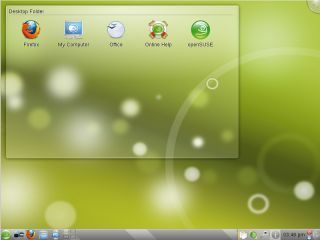 Chakra is a version of Arch Linux customised for live use with the KDE environment. It's also the most experimental of the distributions we're looking at, but that also means it has some rather advanced features. The first thing you notice is that the default live desktop is fairly close to the KDE default, with the exception of the desktop folder. This contains links to some common desktop tasks, including documentation, installation, and a few KDE applications. This is where Chakra makes its mark, because it links to a preview release of K3b 2.0, Kaffeine 1.0 and Arora. The WebKit-based Arora browser in particular feels completely at home on the KDE desktop, and is a great replacement for Konqueror's increasingly clunky web surfing. We wish other distros did the same. Click on the Install button and you'll see a custom installation app called Tribe, which is written in Qt. This really helps with the feel of the desktop, and while Tribe still has a way to go when it comes to user management, we had no problems partitioning the drive and installing a permanent version of Chakra on our hard drive. The highlight was the use of the Marble 3D globe as a location selector. When we finally got to the desktop, however, we were disappointed that the application links of the live version were no where to be seen. This default desktop is a plain old KDE installation. It doesn't even include the handful of helpful home directories you might expect to find, such as one for the desktop, photos or documents. It's rare that the live version of a distro is more functional than the installed version, but that seems to be the case here. Tons of potential and an exciting rate of development mean Chakra is a distribution to watch.